Hilary Garratt CBE, BSc, MSc, RGN, RHV, PGCE is the Director of Nursing in NHS England and Deputy Chief Nursing Officer for England. Hilary leads a nursing and midwifery team in NHS England that focuses on a number of national statutory functions and professional development priority areas. 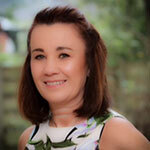 She is a registered Nurse and Health Visitor with over 30 years’ experience of working in the NHS. Hilary has held a number of director posts and a deputy chief executive post in both Commissioning and Provision and has been working at National Director level for the last four years. From 2013 – 2017 Hilary also volunteered for BBC Children in Need and was a committee member that undertook grant making for the North of England. She is also a trustee of a charity, “Giving to Gambia” and enjoys working in the Gambia for a short time each year as a volunteer to support initiatives that improve health and wellbeing. Hilary worked in the Calais refugee jungle in 2016 and witnessed the reality of individuals, living through unimaginable trauma. She saw children being lured into the hands of criminals for want of a better life and seeing this first hand brought home the sheer importance of the NHS and other organisations across the health and care system working together to protect the most vulnerable people in society. Follow Hilary on Twitter: @HilaryGarratt.